Of course, you’ll want to keep a special container of coconut oil set aside for your diaper ointment. Again, just because you cook with it too doesn’t mean it should come out of the same jar! You can be keep coconut oil diaper ointment in baby’s room or in the fridge. I prefer to use it at a cooler, solid state so it’s less messy to apply and more like the consistency of a regular diaper ointment. It melts quickly when it touches skin, so it’s very easy to apply when solid. Simply put coconut on affected area just as you would a regular diaper cream or ointment. Apply early. 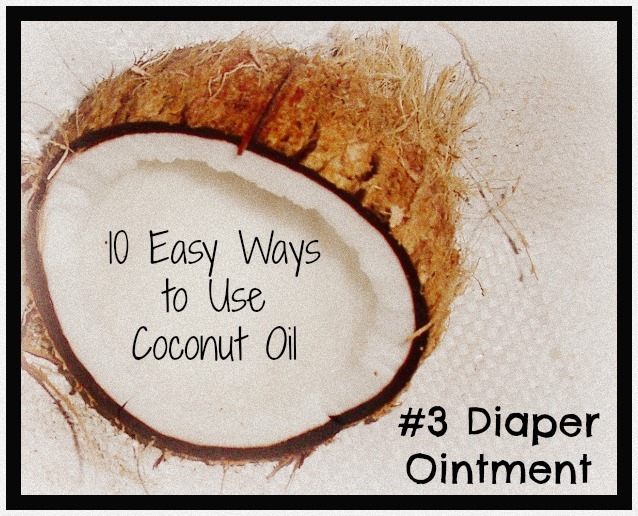 For best results, apply coconut oil diaper ointment at the very first sign of a problem. Apply liberally! Use a bunch…don’t be shy. Slather it on in a thick layer for best results. Since it’s completely pure and natural, you don’t have to worry about any harmful chemicals, toxins or dyes touching your little one’s skin. Apply often! Since coconut oil easily absorbs in the skin and isn’t a barrier product like traditional diaper creams, you’ll want to apply it often. Optional: Add a couple drops of therapeutic grade essential oils. Be really careful here to only use pure and unadulterated essential oils, such as Young Living. Not all essential oils are created equal and it’s not worth putting something of low quality on your baby. If in doubt, leave it out! If you decide to add them, lavender, roman chamomile or tea tree (melaleuca) are excellent options that are all great skin conditioners and generally considered safe for babies. ** Always keep products with essential oils in a dark colored glass jar. One of our children was prone to yeast infections as a baby. After taking her to the doctor for the first couple infections, we learned to spot them early on and treat them with coconut oil at the first sign of a problem. When we caught them early enough, coconut oil took care of the issue and we avoided a costly doctors visits. Use non-toxic, chlorine-free diapers to significantly cut down on diaper rashes. Years ago, we made the switch to non-toxic diapers (cloth and disposable) and noticed a huge decrease in diaper rashes. Honest brand is my very favorite disposable (and adorable to boot! ), with Earth’s Best a close second. *Applies to plain coconut oil diaper ointment. Please use appropriate caution if you opt to add essential oils. Even high quality, safe for adults to ingest, essential oils often to not apply to infants or young children, so know your products and keep out of reach of children if essential oils are added! **I’m not a doctor or an expert, just a mom passionate about all things green who loves to share what I learn. You are responsible for your family…my blog is not medical advice of any kind, it is a compilation of my experience and antidotes Also, when I discuss essential oils on my blog, I am primarily talking about Young Living essential oils. There are very few brands I would consider safe enough for babies. This entry was posted in Coconut Oil, Green Kids Products, Natural & Organic Beauty Products by gree8956. Bookmark the permalink.